When you hear the word “bankruptcy” you don't usually get a positive vibe. And when you hear on the news that a celebrity or sports figure has filed bankruptcy, you likely think, “Wow – they're in financial trouble.” But often, the thought process about bankruptcy puts the cart before the horse and people think that bankruptcy is the cause of financial problems when quite the opposite is true. 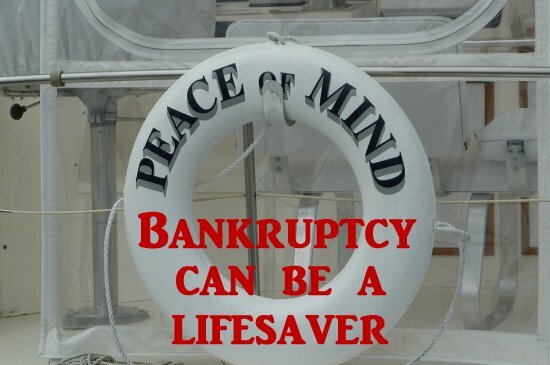 Bankruptcy doesn't ever cause financial problems – but it can be a well thought out result and solution to them. Bankruptcy itself isn't the inability to pay your debts – it's a solution to help you recover from that situation. Bankruptcy isn't something you should be afraid of. In fact, if you're terribly deep in debt and struggling with bills you can't pay, it's something for you to embrace to get you out of an unfortunate circumstance. Done with the right timing and with good advice from a reputable North Carolina bankruptcy attorney, it can be the best thing for you if you're hopelessly in debt. #1 Your past due medical bills will all be gone. No more collections calls and letters. #2 Your credit card bills and balances will be wiped out. No more stress over there. #3 If you have lost a car or home to foreclosure, any lingering bills or balances will be gone. #4 If you owe past due utility balances or closed accounts, those will be wiped clean. #5 If you owe back taxes but filed your returns on time, these may be eliminated as well. #6 If you are being garnished, this can stop and you may be able to get some refunded. #1 Past due balances on your mortgage can be paid out over time to let you catch up. #2 Second mortgages can be wiped out if there is not enough equity to support them. #3 If you owe more on your car loan than it's worth, the loan balance and interest rate can be reduced. #4 If you have a past due balance on your car loan, you'll get time to catch up. #5 If you're being garnished for student loans or taxes, these can be cut back while you are in repayment. #6 At the end of your repayment plan, remaining balances on credit cards and medical bills can be wiped out. When you're deep in debt, it can be tough to see the light at the end of the tunnel. Bankruptcy can be that light – a chance to eradicate your debts or breathing space to get caught up. It's an opportunity for a clean slate and peace of mind. Being in over your head on debt is stressful and can be all-consuming. Don't let debt destroy your life – contact the law offices of John T Orcutt for a free consultation at one of our convenient North Carolina locations.